Public libraries and afterschool programs share the common goal of providing safe and enriching environments for participating children and engaging families in their communities. Across the country, 10.2 million kids attend afterschool programs where they have access to a healthy snack or a meal, academic help, and enrichment activities like reading, STEM, and art. Lights On Afterschool is the only nationwide event celebrating afterschool programs and their important role in the lives of children, families, and communities. This year afterschool-library partnerships are being celebrated as an official theme for Lights On Afterschool 2018! This is a great opportunity to showcase a afterschool or summer program that you run out of your library, highlight a partnership you already have, or begin a new partnership with an afterschool program for the first time for a Lights On Afterschool event, October 24. To celebrate the shared goals of libraries and afterschool programs and how they work together to support their communities, library-afterschool partnerships is an official theme of the 2019 Lights On Afterschool! And if you haven’t already partnered with an afterschool program in your community, now is a great time to start. If you are looking to plan an event, search for programming ideas on the Event Ideas & Activities page, and be sure to register your event to show others how you are keeping the lights on afterschool. Libraries and afterschool programs make great partners. Every October, the afterschool field celebrates the important role these programs have in the lives of children, families, and communities. This year, we want to make the celebration bigger and better than ever. 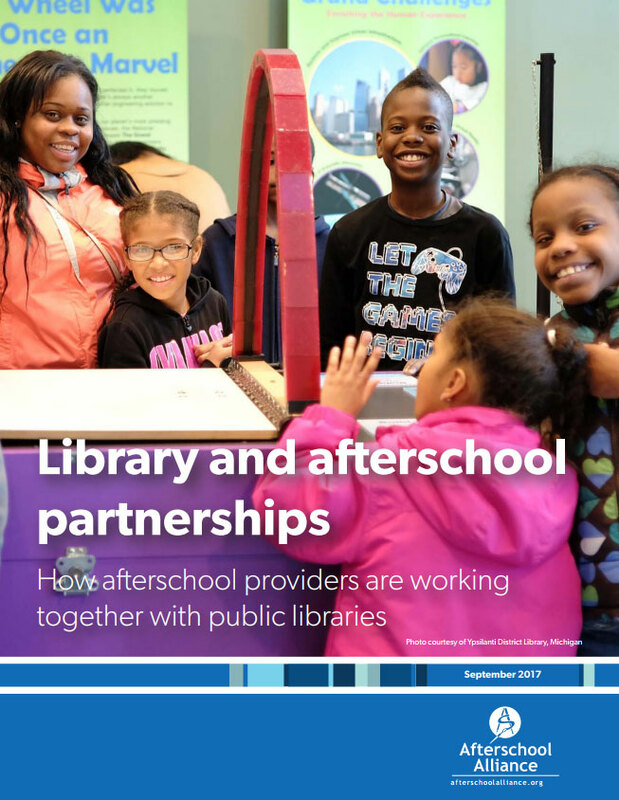 Library-afterschool partnerships are an official theme of this year’s event—and we want to highlight the many ways libraries and afterschool programs are pairing up to provide engaging learning opportunities and critical supports to children and families across the country. Join us for this webinar to learn more about Lights On Afterschool, and how your library can participate. America will light up for the nation’s biggest rally for afterschool on October 24, 2019. Be a part of the celebration! Today, 19.4 million children would participate if a program were available. Afterschool programs keep kids safe, help working families and inspire learning. They provide opportunities to help young people develop into successful adults. Will our library receive anything for registering? When you register your event as an official Lights on Afterschool celebration, you’ll receive an event starter kit, which includes 10 free posters to help you promote your event, and make you eligible for cool prizes each week. Who is supporting the Lights On Afterschool program? 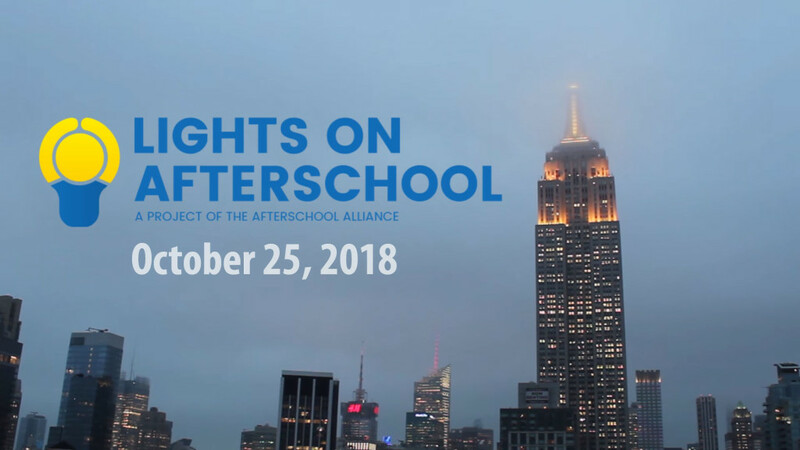 Lights On Afterschool is a project of the Afterschool Alliance, a nonprofit organization dedicated to ensuring that all children have access to quality, affordable afterschool programs. Former Governor Arnold Schwarzenegger has served as Chair of Lights On Afterschool since 2001. Organizations around the country help to promote Lights On Afterschool to their members and networks of chapters, affiliates and programs. Click here for our partners list. With the support of STAR Net (Science Technology Activities and Resources Library Network), a project of the Space Science Institute’s National Center for Interactive Learning (NCIL), and the American Library Association, the Afterschool Alliance surveyed 365 afterschool providers on their perceptions of public libraries, what kinds of partnerships they have, as well as ideas for future growth.